It’s not perfectly to scale but it’s close enough to work from. I haven’t figured out what’s going where in the shop yet but this is about what I’ll have to work with. 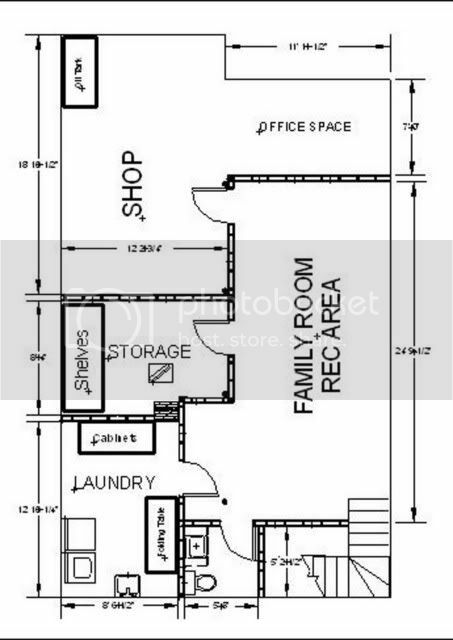 We want to add a bar to the Family Room/Rec area, there needs to be room for the exercise stuff and I need to fit a small office area in here somewhere. So the shop floor keeps getting smaller with each rendition. It’s becoming apparent that my original vision of the shop was a bit ambitious. is the office space open to the shop? and will it have computers and such in it? That’s one of my dilema’s Ms Deb. The answers right now are yes and yes and I know I need to do something about it. I’ve also got a water meter pit in the office area to contend with too. I originally had a wall separating the office and shop with a door between the office and family rooms. The thought behind deleting them was to open up the shop space some more. I still haven’t convinced myself that it’s a good idea yet. I’m not sure I can come up with enough dust collection to keep the office clean enough. what about switching the storage area with the office area? Storage stuff is usually in containers anyway… the two spaces look to be almost the same size. but I’m sure you have reasons for the room areas that you have indicated. or move the office area BESIDE the storage area, putting your shop space elongated in the other direction..
or.. lol no more ideas here. KEWL shaun. Nice to see the plans. By posting here, are you looking for a little brainstorming from the LJ’s, or are you set in your plans? Do you have to drag materials clear through the house to get it into the shop? Or is there an outside access? Are you utilizing the storage area under the stairs? OH-here is an idea I tried to sell to some clients, make the area under the stairs a built-in playhouse for the kids. It is boxed in, similar to a situation that I had on a remodel. I could have had a small door opening (no door) and a window hole to make it look like a house front. Put a light inside, maybe box it in a little where the steps get close to the floor and sheetrock the little space. Very good and creative idea for years of fun – no sell. I think that setting up a shop area has to be one of the hardest decisions -and then, throw in family room, storage, office… phew. I’m impressed that you have your plan on paper! My basement shop is tucked away in the corner. Todd, it’s a real tough thing getting in and out. Getting materials in and out can be a royal pain. Nice so far shaun, but I’d consider a wall between the shop and the office. You’ll never control dust enough to have any type of work environment. Aw phooey, forget the office, work on the kitchen table! MORE shop space!!! Out with the family room!!! Let ‘em play in the street, MORE shop space!!! It’s never easy, is it?? Who needs a family room, storage area, office space anyway?? !! LOL Thos. Beleive me I am 100% in the “more shop space camp” but the Mrs get’s a vote here and I haven’t been able to convert her. The plan actually started out with no family room and all of that area being shop but the 1st floor plan includes converting an existing 10’x12’ room that currently serves as the office/den to an 8’x12’ so that we can increase the size of the existing full bath then the 8’x12’ will become a walk in closet/dressing room. It’s a small house to begin with, about 850 SF on the first floor, unfinished attic with no good access, roof is pitched to the floor, and I’m not building up. So the plans for the shop have been cut twice. Once to make up for the loss of the existing office and then again to add living space. Even if you count the walk in closet (which is kind of a stretch in my book) we still fall short of our “double the living space goal”. So I had to compromise which I can live with for now. We anticipate selling this one in a couple of years with the next home purchase intended to be the one we stay in. That one’s going to have an out building to house the shop. I’m following Calgirl’s progress and making many notes for that one! Todd – I’m stuck dragging things through the family room to get to the shop. I had to choose between walking through the shop to get to the family room or drag things through the famiy room to get them in the shop. I went with the latter. We’re figuring on utilizing the space under the stairs but there’s a landing that is about 5’ off the basement floor for me to contend with. I need the landing to keep the staircase to code and part of it looks to be load bearing so I’m a little hesitant to mess with it. Whatever we end up using it for will be limited to 5’ in height. Dadoo – By all means, send in those ideas man! But do it quick, I started framing in the walls. Shoot, I’ll send ya the CAD file if ya want it! (mot) – Deep down I know that’s what I have to do but that wall between the office and family room used to be about 8’ south of where it’s shown now and there was no office space. Physcologically I’m trying to hang on to shop floor. Sooner or later I’m going to have to let go of the 400SF shop and wait for the next house. ah ha …. thanks for the info behind the plans.